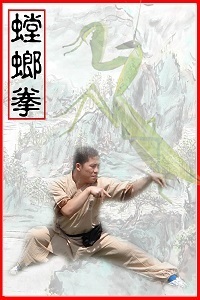 Kung fu is famous for its many animal styles, from tiger to from crane to snake, each with its own unique characterisics. They can be truly beautiful and fascinating to watch, and great fun to practice, as well as helping to develop particular skills and physical strengths and to give the practitoner techniques that are often unpredictable to defend against. 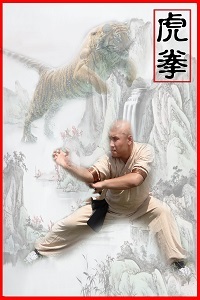 The Tiger style (Hu Quan) is one of Power, Directness and Simplicity. It's primary target is the opponents throat. Its primary Weapons are the Fist and the Claw. Footwork is only used to interfere as the tigers needs good ground contact to develop and deliver it's power. Learning the Shaolin Tiger you will discover the power of Simplicity and Directness. You will learn to identify the main point of contention and then develop the skill and power to reach this point. Crane style (He Quan) trains flexibility. 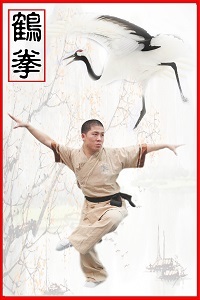 The focus of the White Crane style is to make less use of physical strength, stressing evasion and strategic attacks to vulnerable areas instead. 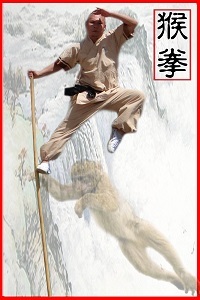 The Monkey stylist (Hou Quan) jumps, flips, rolls, and climbs to avoid his attacker. He attacks from peculiar angles, and contorts his body to strike when the opponent believes himself safe. 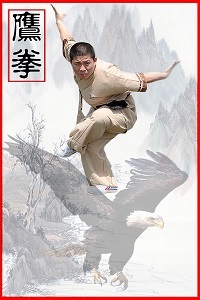 Eagle claw style (Ying Quan) is an animal style derived from the grappling art of Shaolin Chin Na. It relies on very powerful seizing, pinching, twisting, and locking techniques to immobilize or punish an attacker. Eagle claw stylists work hard on developing their grips to facilitate application of painful locks and nerve pinches. 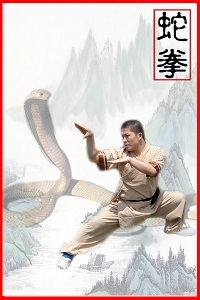 Snake Style (She Quan) trains chi (Internal Energy). The Snake goes for vital points. The eyes and throat being common targets. Snake movements are flowing and rippling with emphasis on the fingers. 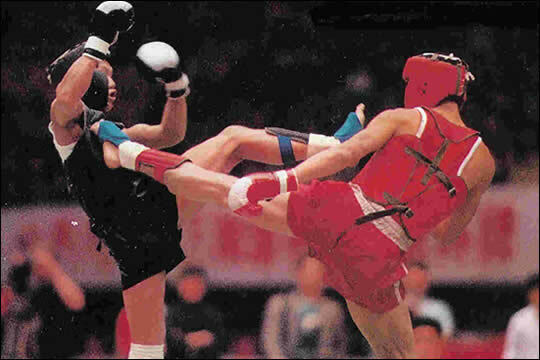 Sanda, 'chinese kickboxing', is also called Sanshou ,which roughly translates as "actual combat". In the past, Chinese called it "technique fighting" or "striking". The simple concept of Sanda is two people fighting against each other without weapons. The four attacking methods are Kicking, Hitting, Wrestling, and Controlling. Sanda combines using skill in pose and technique. The Sanda pose is normally called a "ready" stance, where the fighter is prepared for combat. Training in Sanda can help you keep your body in powerful condition, and develops the quickest of reflexes. There are two poses in Sanda: Left and Right Pose. For the left pose, one of your feet stands out, the other, behind. The distance between the heel of the forward foot and the tiptoe of backward foot is the same width as the shoulders. The sole of your left foot completely touches the ground, while the heel of your right foot rises up a little. Your knees naturally bend a little. The center of gravity of your body moves to the right, the chest moves up and your stomach folds inwards. The left arm twists inside about 90 degrees, while the center of the left fist moves parallel to the tip of your nose. Your right arm twists inwards about 45 degrees, and your two fists come in front of your neck. The elbows keep naturally vertical or a little inwards, and your chin stays is a little lower. All the time, your eyes focus on the upper body of your adversary. The movements of Sanshou are that of a fighting art, however it is distinct from fighting martial arts that cause injury and disabilities. Sanshou has strict rules to ensure the safety of the two fighters. Rules state that attacking the back of the head, neck and crotch of the opponent is prohibited. In Sanshou, you are allowed to exercise the skills of different Wushu schools. After long-term training, having mastered Sanda skills a Sanda practitioner will have very fast defensive and offensive reflexes if suddenly attacked. In comparison to an ordinary person, a Sanda athlete has a much higher resisting ability. Sanda not only improves physical qualities such as strength, endurance, flexibility, and sensitivity but also develops people's health both physically and mentally. Sticking to the training makes the body strong and strengthens bones and muscles. The skill of Sanda is in combining movements of Step, Fist, Leg, Knee, Wrestling, Defending and Constant attacking.